This article deals with choosing an appropriate front derailer to meet the needs of your shifting system. See also my Article on Derailer Adjustment for detailed instructions. Derailers look complicated, but they are actually very simple, brute-force devices, especially front derailers. They simply consist of a cage made of sheet metal that can move back and forth from side to side. Older front derailers had the cage mounted on a simple sliding plunger, but modern ones use a parallelogram linkage for reduced friction and better tracking of the chainrings. Front derailers work by pushing the chain sideways, so that it runs at an angle onto the chainring, instead of straight. When the angle becomes sharp enough, the chain can no longer mesh with the chainring. It then falls off of the chainring and lands on the next one down. When the chain is being shifted from a smaller chainring to a larger one, it is slightly different. The chain is forced to rub against the side of the larger chainring next to the one it is riding on. Eventually, it gets snagged on the sides of the teeth of the larger sprocket, and yanked up and away. 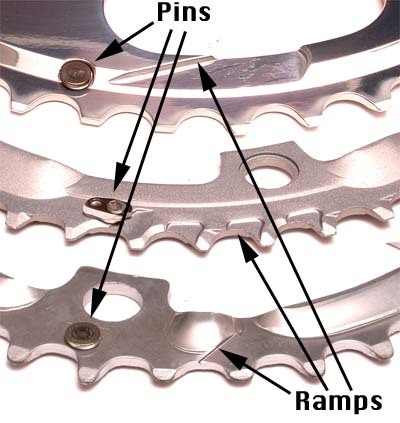 Newer chainrings usually have specially shaped pins and ramps on their sides to help snag the chain for better upshifting. This is especially helpful with today's narrow chains, which do not have protruding rivet pins, like the chains used with the 5-speed freewheels of the 1970s. The front derailer does its shifting using the upper run of the chain; the rear derailer, using the bottom run of the chain. The upper chain run is the section that transmits pedal power to the rear sprockets, so if you are pedaling forcefully, the chain is less able to bend sideways due to the tension. That is why it is essential to ease up while shifting in front. This is not so much an issue with rear shifting, because the rear derailer does its work with the lower, slack run of the chain. 1 1/8" (28.6 mm) clamp-on. (This is the traditional, standard type for most road bikes and older MTBs). 1 1/4" (31.8 mm) clamp-on for mildly oversized seat tubes. 1 3/8" (34.9 mm) clamp-on for oversized seat tubes, common on aluminum frames. Braze-on mounts will limit your options for choosing different chainring sizes. Braze-ons permit some limited range of vertical adjustment, but not always enough. "E-type " Shimano units have a bracket that is held on by the bottom bracket retaining ring. These also use a special braze-on to stabilize the derailer. E-type mounts allow adjustment for chain slope, but do not permit any adjustment at all for chainwheel size, so you generally need to use exactly the size chainrings that your E-type front derailer was designed for. Traditional front derailers are "bottom-pull", operated by a cable running up from the bottom bracket area to the derailer. "Top-pull" derailers are operated by a cable running down from above. This design is mainly used on mountain bikes, with the intent of avoiding running the cable under the bottom bracket, where it is exposed to spray kicked up by the front tire. Some older designs use a loop of cable housing running from a stop near the bottom of the down tube. This design hasn't been used since the mid-1970s. Fortunately, it isn't difficult to work around this. If you want to mount a modern derailer on a bike intended for this type of mount, just ignore the housing stop near the bottom of the down tube. Run the bare cable under the bottom bracket and up to the derailer's anchor bolt. If you are worried about protecting the paint under the bottom bracket, there are two easy ways to protect it. Easiest is to use a short length of "floating" housing, a piece of housing perhaps 2-3 inches (50-75 mm) long under the bottom bracket. This does not need housing stops at either end. The tension on the cable will make it stay in place. A more elegant solution is to install a modern plastic cable guide under the bottom bracket. Normally, such guides are secured by a 5 mm screw, so you would need to remove the bottom bracket mechanism, then drill and tap a 5 mm hole for the screw. This is easy to do. The slope of the chain relative to the front derailer is affected by the seat tube angle, bottom-bracket height and size of the rear wheel. Derailers are specified for different angles. The issue is most critical with small-wheel bicycles, and can result in the chain's dragging on the bottom of the front derailer's chain cage. A braze-on or E-type front derailer can work around this problem. Front derailers shift best when they are mounted as low down as is possible without having the cage foul the teeth of the chainrings. In particular, the bottom edge of the outer cage plate should be closely matched to the curvature of the largest chainring. If you use a front derailer with a larger ring than it is meant for, the rear of the cage will get too close to the chainring before the front of the cage is close enough to provide crisp shifting. If you use a front derailer with a smaller ring than it is meant for, the front of the cage will get close to the chainring while the rear of the cage is still far away from it. This won't hurt shifting, but will require excessive "trimming " of the front derailer as you change gears at the back. Mismatched derailers and chainrings may be satisfactory with friction shifting, but will likely cause problems when used with indexed shifters, such as Shimano STI units. If you have unusual gearing requirements, and are handy, you can reshape the outer cage plate with a grinding wheel to match a non-standard large chainring. Modern derailers are optimized for either double or triple chainwheels . The shape of the shifting cage is tailored for the application intended. A "double" front derailer has an inner cage plate that extends down only slightly farther than the outer plate. A "triple" front derailer has an extended inner plate that goes down considerably lower than the outer plate. The extended plate greatly improves shifting from the small to the middle chainring, because it acts closer to the middle ring. "Double" front derailers will work with triples, but if the middle ring is much smaller than the big ring, they will be balky shifting up from the small to the middle chainring. They do, however, work well with "half-step-plus-granny " setups, where the middle ring is only 3-5 teeth smaller than the outer ring. Modern "triple" front derailers have interference problems in half-step-plus-granny setups between the extended inner plate and the inner chainring. "Triple" front derailers are generally optimized for a specific difference between middle and large chainring. Shimano's "10-speed" triple front derailers are optimized for a 13 tooth difference, typically 52-39. Most other Shimano front triple derailers are optimized for a 10 tooth difference between middle and large ring. Surprisingly, the size of the "granny" chainring has little effect on derailer performance. Many cyclists customize their "road triple" cranksets by installing a more-useful smaller ring in place of the 30 that comes stock. The only limitation here is that the chain must not bottom out in the chain cage. This is generally not a problem if the large chainring's tooth count is in the mid 40s. It may be a problem if the large chainring is larger. A "compact" cassette whose smallest sprocket has 11 teeth can get around the problem by allowing the use of smaller chainring without sacrificing the top end of the gear range. With today's cassettes that have 8 or more sprockets, you can still have narrow steps between speeds, and a large sprocket with as many as 34 teeth for a low bottom gear. Many front derailers are designated for some number of speeds in back. This is actually primarily a marketing distinction, not a functional one. Pretty much any front derailer will work with any modern chain system. It is true that the cages have gotten slightly narrower to match the narrower chains used on systems with more rear sprockets, but this is rarely a problem in practice. See also my Article on "Speeds." The ratio of cable movement to derailer movement differs with Shimano's "road " vs. "MTB " front derailers. This can cause indexing problems if you use a "road" front derailer with upright handlebars or a "MTB" front derailer with drop handlebars. This is a concern if you are running an indexed front shifter, such as Shimano STI or RapidFire shifters. It is not a problem if you are using a friction system, such as bar-end shifters or downtube shifters. It is also not a problem with ratcheting systems such as Campagnolo Ergo. Shimano does make one model of front derailer designed to work with "road" (52-42) chainrings and RapidFire upright-handlebar shifters, the FD-R440 model. Also, JTek makes a Shiftmate adapter designed to convert between Shimano's "road" and "MTB" components, offering another solution. As you shift the rear from side to side, the angle of the chain changes where it approaches the front. Sometimes, this results in the need to "trim" the front derailer. For example, you may start out in the lowest gear, with the chain on the innermost chainring and innermost rear sprocket, and everything is running smoothly. As you build up speed, you typically shift the rear derailer outward, toward the smaller sprockets for successively higher gears. At some point, this may cause the outside of the chain to rub against the outer plate of the front derailer's cage. This is noisy and will wear a groove in the derailer cage if you persist. With traditional systems, you would deal with this issue by "trimming" the front derailer, that is, you would pull back very slightly on the front derailer's shift lever, to nudge the cage a bit outward to eliminate the rubbing. That works fine if your front derailer is operated by a friction shifter. 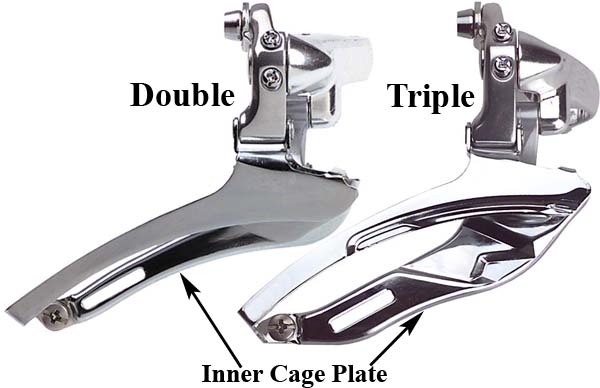 With the advent of indexed front shifters, such as Shimano's STI and RapidFire units, the possibility of trimming the front derailer is limited by the number and spacing of the indexing detents ("clicks.") Earlier indexed front shifters had little or no ability to trim, but most newer ones have extra detent positions to provide a limited trim capability. In most cases, if you use the specific chainring sizes that the front derailer was designed for, and the front derailer is adjusted very carefully, trimming won't be necessary if you follow good shifting practices. The need to trim is largely dependent on the chainstay length...the shorter the chainstays, the greater the need for trimming, because the chain angle is greater for a given amount of sideways movement in back. This is one of the areas where recumbents have a real advantage, as their very long chains result in minimal angle variation in different gears -- the same with tandems that drive the rear wheel from the front crankset.